As this Bancroft alumna proves, amazing things can happen when you're inspired to pursue your passions and engage with your community — and the world — in meaningful and impactful ways. 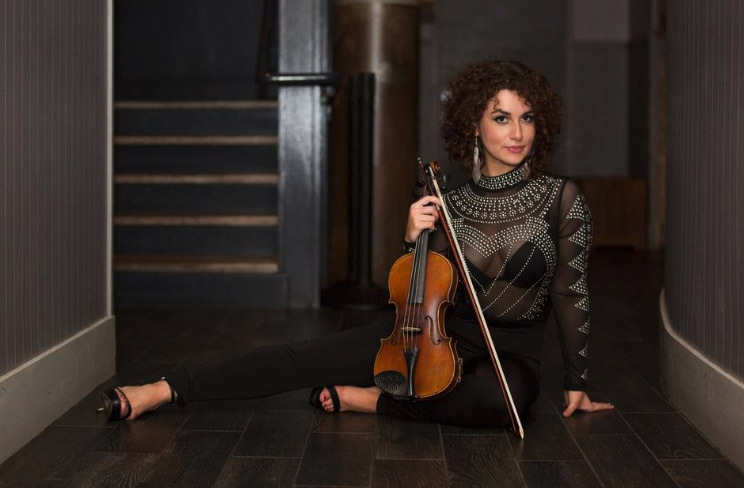 WORCESTER — There was one side of Kristina Danga on display at the Boston Calling Music Festival in May as she played electronic violin with fellow String Candy Music musicians performing for Eminem. Everyone involved was “so modest, so talented and there to have a good time and put on a show,” said Danga, who has been getting a lot of attention recently from both music professionals and fans, including followers on social media. Another side of Danga’s life you won’t likely see, however, is as part of a four-person research lab at Brigham and Women’s Hospital and Harvard Medical School studying a very rare and aggressive carcinoma (NUT midline carcinoma). The work includes 10 to 12 experiments a week testing different drugs. Danga was born and grew up in Worcester, where she still lives, commuting for long work days and then evening performances in the Boston area or recording at Surefire Creative Studios in Lowell. She has collaborated on projects such as the soundtrack for the Michael Flatley film “A Little Bit of Tear” and is working on recording her own EP. She has just released a track, “Zeal,” an evocative instrumental. Other sides of Danga that people have seen include an award-winning pianist while a student at the Bancroft School, as well as a church organist. She’s played violin at Albanian festivals. It’s not a double life, but last year Danga did graduate from Wheaton College with a double major degree in neuroscience and music performance. “She’s a force to be reckoned with,” said Patrice Peris of Patrice Peris Voice Studio in Westboro, who has been mentoring Danga on aspects of the artist management/business side of music. “She’s obviously a very creative force on her own. My job is to kind of guide. I think she could go very far. I know she’s got multiple things on her plate. She’s a very hardworking girl,” Peris said. Danga’s parents are from Albania, where her father was a professional trumpet player and taught at a conservatory in Tirana, the country’s capital. Her grandfather was a violinist. When Danga started playing a toy violin as a young child, her father recognized that she had an ear for music and bought her a piano. “He never pushed me but he gave me the tools to express my ability,” Danga said. She studied piano with Olga Rogach and also violin with Zhaneta Naco and Rohan Gregory. At the Bancroft School she played violin for the Bancroft Trio with pianist Mackenzie Melemed, who has gone on to an international award-winning career as a pianist, and cellist Ned Brose. She played piano and organ for Chaffin Congregational Church in Holden and was an organist at St. Mary’s Albanian Orthodox Church for eight years. As a 17-year-old pianist, Danga was a winner of the Anick Award for Musical Excellence and performed at the Anick Young People’s Performing Arts Festival Concert in Marlboro. Her younger brother Lazi Danga, now a student at Worcester Polytechnic Institute, is also an award-winning pianist. Meanwhile, the music of Albania that she heard at family gatherings and festivals would have a profound influence, as well as Eastern European music. At Wheaton, Danga started with piano/violin studies. But doing a double major of neuroscience and music “is different, I’d say,” Danga understated. She decided to concentrate on violin. “I had to figure a way to keep going on with music without stressing myself out,” she said. Meanwhile, her musical interests evolved from her classical training to experimenting with other styles and ultimately house music/electronic dance music as an electronic violinist. Her high-intensity performances have landed her gigs around Massachusetts and collaborations with Boston and New York City producers. 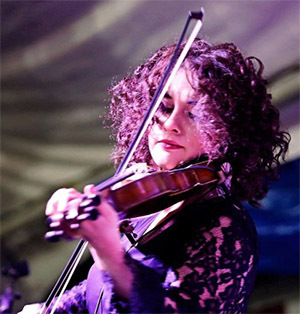 It was through such connections that she was approached to rehearse and perform with String Candy Music, many of whose musicians are graduates of some of the best music schools in the country. Danga and Peris have also been working together at the recording studio backing each other up on their own respective projects. Peris is working on a new vocal release. Peris noted that Danga has “years of training leading up to this. The small amount of time as a solo artist she’s been able to land a gig with Eminem. I think she can take it wherever she wants to take it,” Peris said. So will Danga ultimately take sides, perhaps focusing 100 percent on music? On the other side of things, Danga said she’s recently started applying to doctorate programs at universities with a view to studying oncology and molecular biology. “If I could stay and keep my science job and do the music because I love the music, that would make me happy,” Danga said. Copyright 2018 Worcester Telegram & Gazette. Reproduced with permission. Photos courtesy of Scott Raymond Photography and Eda Stefani Photography.